Training your four-legged friend to be more agile and active is a highly rewarding activity for both you and them. As well as strengthening the bond between the two of you, it also gives them a physical workout and provides mental stimulation. No longer does dog agility training have to be reserved for professionals; you can get involved yourself. 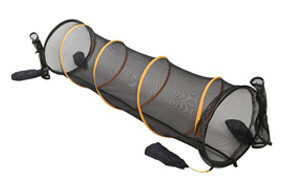 And an essential piece of equipment which you should consider getting your hands on is a dog agility tunnel. Essentially, this is a flexible piece of equipment which you can train your dog to run through. However, if you have never bought a product like this before, you are going to need some more information on the different available options. The following guide is here to help by offering a rundown of the best dog agility tunnels available right now. 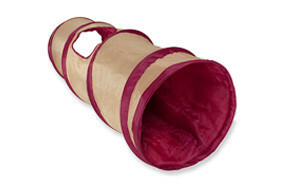 First up on our list, we have this foldable tunnel which pops open as soon as your furry friend is ready to use it. Inside is crackling material which is designed to heighten the mystery and capture their attention. When you aren’t using it, the tunnel is easy enough to store away with the attached ties. This is a great option if you have a smaller pup who needs agility training. Always check the measurements to ensure that your dog will pass comfortably through it. Ultimately, it is an excellent way of exercising your small pet while having fun yourself. 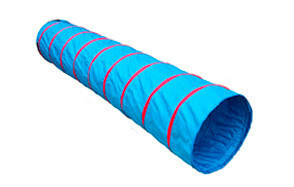 Whether you want to use it indoors or outside, this agility tunnel is ready to unfurl whenever you need it. No tools are required in its setup. Not only does it fold down to less than two inches, but it also comes with its own carry bag which allows you to take it wherever you need. Since it is see-through, you can always check up on your pet and encourage them to run through the tunnel with treats. This 18 ft long with 24″ opening dog tunnel comes in a classic design. The blue cover has been woven together using Oxford Dacron. But there is also an extra level of durability as the grommets are made from steel rather than plastic. Due to the way that it is designed, it should not scratch your pet, which is obviously important when they are running at high speeds. Also included is a carry case with clear plastic pouch. Made from a heavy-duty construction of weave fabric, there is plenty of interior padding around the steel wire structure. After all, it needs to withstand a lot of rough play with your dog running through it all the time! After use, you can simply wipe it clean using a damp cloth and mild soap. When you are no longer using the tunnel, you can collapse it flat for easy storage and portability. Suitable for most breeds of dog, this dog agility set provides you with everything you need to get your dog moving like lightning! As well as the 9 ft long tunnel, some of the other items which are included are a bar jump, weave poles, tire jump, and pause box. The assembly instructions are easy to follow, and everything is suitable for indoor or outdoor usage depending on how much space you have available. There is also a big, sturdy carrying bag for you to pack everything inside. Designed to contain sand or water bladders to hold it down, you can be sure that this agility tunnel is going to stay in place. Essentially, these make it more likely that it is going to stay still while your canine companion is bolting in and out of it! You can pick it up via the PVC strap which hugs the tunnel rather than restricting it. Ultimately, this is an affordable option to start your dog off in the world of agility training. A spacious tunnel for your four-legged friend to run through at their leisure, it is suitable for bigger pets or multiple smaller ones. When it is not in use, you can simply fold it down and take it with you wherever you like inside the carrying case. If you need to fix the tunnel down a little bit better, you can use the 8 PCS ground nail to do so. Also included are 2 PCS flying disks for playtime. Whether you are training your dog up professionally or you just want to have some fun, this dog play tunnel is designed to stand the test of time. Since it is made with Oxford polyester in an accordion design, it is very easy to set up, put down, and transport, as needed. If you want some added stability and security when putting the tunnel down, 12 stakes are included to stop it moving around so much. Ultimately, this is an ideal piece of equipment which keeps your dog mentally stimulated and physically engaged. Before rushing to buy your dog agility tunnel, you should look in more detail at some of the different features and variations. So, here are just some of the factors which are all worth considering. As you will have been able to tell from the above product selection, agility tunnels come in different shapes and sizes. Some are only suitable for smaller dogs and cats, while others are sizable enough to accommodate bigger pets. However, if you only have a petite dog, you may not want a larger tunnel as this could end up being too intimidating for them to use. So, before investing in a tunnel, get your tape measure out to get a better idea of the dimensions of your furry friend. The better suited it is to their size, the more likely it is that they will experience the maximum benefits of using it. Many of the above tunnels are made from polymer fabrics like Dacron. Essentially, whatever material you choose needs to be versatile enough to resist the wear and tear of your dog scrabbling through on a regular basis. While these tend to be a lightweight and affordable option, you should make sure to pack them away properly rather than leaving them outside. Alternatively, you could choose a tunnel which is made from PVC. Since these are heavier, you are less likely to need additional materials to weight them down. While they tend to be pricier, they may be the better option if you are planning on training your pet in a serious capacity. On the downside, they are usually less portable and are better in a fixed position. While price shouldn’t be the only factor which plays a role in your decision-making, you are probably better off not simply choosing the most expensive product on the market if you have never bought at agility tunnel before. At the same time, while the more affordable options may seem like a good deal, they may not stand the test of time in the same way. Ultimately, it is a good idea to check the reviews to see what other people have had to say about each of the different tunnels on your list. Some of the products available come as a kit including other agility training obstacles and toys. You have the choice of whether you just want the tunnel on its own or if you are really serious about agility training and need an entire set. Again, if you are first-timer, it is probably better to start off small, but if you are a more experienced trainer, you may decide that the entire kit is for you. You should also check out what additional features your agility tunnel comes with. Many of the above models come with a carrying case which makes them easy to transport from one place to another. One comes with extra toys which you can use to play with your furry friend. Another is made with noise-making material inside to encourage your dog to step inside. While these extra features may not make your mind up on their own, they may prove to be that little incentive to choose one particular tunnel ahead of another. Now, you may be wondering what some of the main advantages of training your dog to use an agility tunnel are in the first place. Well, here are some of the major benefits which this activity offers. If you want to dip your toe in the water of agility training, a tunnel is a great starting point as it is one of the easiest agility tasks to teach to your furry friend. It is ideally suited to gradual training. To begin with, you can shorten the tunnel by scrunching it up, before gradually adding length as your dog starts to become more confident. Once your dog has mastered this skill, you can then bend the tunnel so your dog can’t clearly see the end, which is more daunting for your furry friend, but you can get them used to it with a little time and patience. After you have mastered the tunnel, it is time to introduce them to more complex activities. Perhaps you could look at investing in some more equipment. Alternatively, you could choose a dog agility kit listed above. Just like humans who do the same exercise day after day, dogs are likely to become bored if all you do is play fetch with them. By varying up their exercise regime, you can encourage them to enjoy the physical activity they need – and most dogs simply love running through tunnels. As you will already be well-aware, regular exercise is an essential part of the healthy lifestyle of your four-legged friend. And since you will probably want to run along with your dog while they are in the tunnel, it also provides an excellent source of exercise for you too. So, while you intended this to be an activity for your dog to get into shape, you could also find yourself getting fitter too, which is never a bad thing! Since dog agility equipment offers a combination of training and physical exercise, it is useful in ensuring that your pooch stays well-behaved. Not only are you teaching them to respond to commands, but you are also giving them the mental stimulation which they crave. Another plus point is that you are helping for forge a stronger bond between you and your pet. Dogs love their owners to pay attention to them and provide them with new activities, and a pet agility tunnel certainly ticks both of these boxes. Another advantage of dog agility training is that it offers another social opportunity for you and your canine companion. This is especially the case if you decide to go along to dog agility training sessions where you are bound to meet like-minded owners, and your dog can meet like-minded canines! After all, providing your dog with ample opportunities to socialize is another dog owner responsibility which you can tick off the list by taking up this hobby. There is no doubt that starting off in the world of agility training for your dog can feel intimidating at first, but you can soon learn the basics. Here are a few useful tips to get you started. A combination of verbal commands and hand signals form an integral part of guiding your dog through the course. It is easier for your dog to understand if you keep the commands short and snappy. While any word has the potential to be successful, you need to use it consistently. Otherwise, your dog will not associate it with the action. Ideally, your dog should already be able to understand some core commands such as ‘sit’, ‘stay’, and ‘come’. Once your dog has mastered a command, you can then start introducing them to some new ones. Each new piece of equipment should have a different word associated with it. This way, you can get your dog to comfortably move from one piece of equipment to the next. Stick to one syllable words if possible as these are easier to say and more straightforward for your dog to understand. Good planning is one of the cornerstones of successful dog agility training. If you train your pup on a more regular basis, they should get the hang of it quicker. You can start off with a quick warm-up, before diving into the training. Don’t make the sessions too long as you are only likely to exhaust your dog and put them off continuing. To begin with, you should only introduce them slowly to one or two pieces of equipment. Over time, you can start to bring in more apparatus into their routine. Try to vary up your commands to keep your dog on their toes. You should start by making sure that your dog has mastered a particular piece of equipment, before trying to up their speed levels. Remember to take your time. It may seem like your dog has mastered a certain command in one session, but they suddenly seem to forget it the next. Over time, you will get the type of memory longevity that you are looking for. After that, you can encourage them to become speedier. When you start a new hobby for the first time, it can easily seem intimidating and impossible to master. But there are plenty of beginner’s classes out there which can help you to improve your skills. Not only are you getting advice from the experts, but you can also enjoy a more social side to the hobby rather than trying to do everything all by yourself. It is often more fun when you learn together! Also, you can get direct advice and input on how you can improve, so you are not stuck scouring the internet trying to find out what is going wrong. The whole point of agility training is that it is supposed to be fun for you and your dog, so don’t lose sight of this when it starts to get a little tougher and more frustrating. Remember that you are strengthening the bond between the two of you, getting out in the fresh air, and learning a new skill. If you do find that a training session is particularly tough, you can always cut it short to try other things. The next one may end up being a lot more enjoyable. Q: What is dog agility? A: Dog agility is officially classed as a sport which also requires owners to get involved. While there are people who enjoy the practice professionally, there are also plenty more who simply get involved on a casual basis. Most dogs can take part in agility training of some description, and it offers the chance for an exercise of the body and mind. 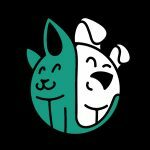 It also crosses over into a form of training as you need to use commands and hand gestures to get your dog to respond in the way that you would like. Q: How do I train my dog to use a tunnel? A: The best way of training your dog to use an agility tunnel is by taking a step-by-step approach. Don’t expect too much of your furry friend, too soon. Your first step is to let them see the tunnel, have a sniff around, and become used to it. When you first try to get them to go inside, you can fold the tunnel up to shorten it. They should be able to see you or another familiar face waiting at the other end. Call your dog and gently tap the bottom of the tunnel to reassure them that it is safe to come through. Once they have made it to the other side, you should reward them with a treat, so they naturally make a positive association with it. Over time, you will gradually be able to lengthen the tunnel as they become used to running through it. And when this starts to become a little boring, you can start to lay it in different shapes to present them with new challenges. If your dog is especially nervous or anxious, it is likely to take time for them to build up confidence. Q: What age should I start agility training? A: You can have fun teaching your adult dog agility techniques at any age, but if you are more dedicated to improving their skills quickly, starting when they are an adult at 12 months old is a good guideline. Bear in mind that dogs cannot enter official competitions until they are 18 months old. As for puppies, you can buy equipment which is specifically designed for younger dogs, but you shouldn’t try anything too intense when they are still at such a young age. At the top of our list is this affordable tunnel, which has been designed with small dogs in mind. To encourage your pup to get inside, there is a crackling material which provides a sense of intrigue and mystery. Fold the tunnel up and pop it open whenever you would like. When you no longer want to use it, you can simply close it securely with the attached ties and put it away. The measurements are 34” long x 9.5” diameter, so you should measure your dog to ensure that they can use it comfortably. Overall, it provides an excellent introduction to agility training for your dog – a hobby which provides physical and mental stimulation for both you and your pet!